The Planning Notepad by John Krissilas: The Future of Farming? By the year 2050, the world's population is projected to be 9.5 billion people. In order to feed all of these mouths, we'd have to cultivate additional farmland the size of Brazil - farmland that doesn't currently exist. So what are our options? We could certainly clear more forests. But that would only add to another problem we'll be trying to solve over the next forty years - global warming. In fact, farming as it's practised today is not an efficient use of resources: it uses 70 percent of the word's freshwater (for irrigation), large amounts of fossil fuel (20 percent of all of the gas and diesel fuel consumed in the States is used for farming), and it must be transported over long distances. In addition, continuing to farm the way it's currently practised is slowly degrading the farmland that we do have. Is there a better way? There just might be: vertical farming. 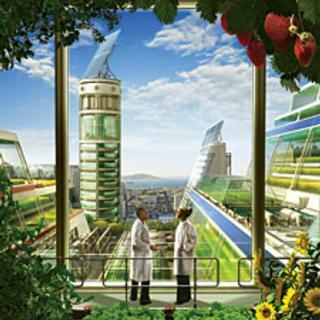 Dickson Despommier, a professor at Columbia University and president of the Vertical Farm Project, writes about the future of farming in the November 2009 issue of Scientific American. The idea is simple: rather than growing crops in fields outside of city limits, we would grow them inside skyscrapers within city centres, sort of like massive, multi-layered greenhouses. 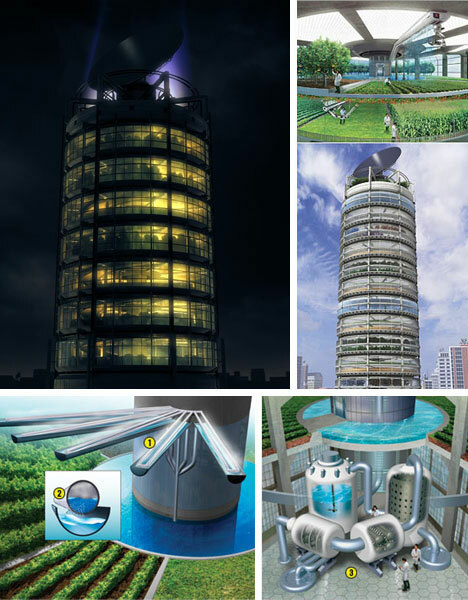 In these 30-story buildings, no soil would be required, as crops would be watered using three existing technologies - drip irrigation, aeroponics, and hydroponics - all methods that limit water wastage. (1) Flexible locations: vertical farms can be set up anywhere water and energy is available, regardless of climate. (2) Higher crop yields: growing food indoors in controlled environments means the seasons and bad growing seasons are no longer a factor - crops will be available year-round. (3) More efficient use of resources: no more wasted freshwater, fossil fuels, or the need to transport crops over long distances. (4) Existing farmland will be allowed to repair itself: fields can be left alone, allowing nature to reclaim the land. New forests can help in the fight against global warming by absorbing the carbon dioxide in the atmosphere. (5) Job creation: a number of urban jobs would need to be filled, including nursery attendants, growers, and harvesters. Ultimately, the goal of vertical farming would be the creation of a sustainable urban food system, albeit one that grows food under unnatural conditions. How excited would you be to eat a tomato, fresh from your local skyscraper? Check out this real working vertical farming system: http://bit.ly/6CXslp They just got robert F Kennedy Jr on their advisory board and are planning 6 more installations aroudn the world in Jan/Feb. including a high profile vertical farm in NY City. If you are going to go vertical then go vertical on each floor. The word is UP!